View cart “White and Color Laser Printer for Laser Heat Transfers,Oki proColor 711WT 8.5×14” has been added to your cart. The Pro8432WT Color Printer with White Toner Laser Transfer Printer produces vibrant, high-quality color heat transfers easily and cost effectively. 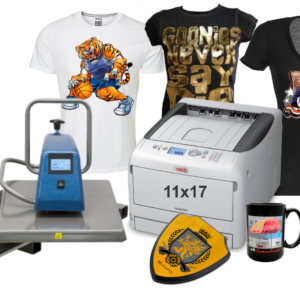 The best White toner laser Printers on the market.White Toner Laser Printer for making T Shirts. The Best White Toner Laser Printer on the Market! The Pro8432WT Color Printer with White Toner Laser Transfer Printer produces vibrant, high-quality color heat transfers easily and cost effectively. White Toner for Dark color shirt transfers. The best white toner laser printer on the market straight through one pass printer. The Pro8432WT Laser Transfer Printer from OKI — the leader in toner based heat transfer printing — delivers White toner technology with solid opacity plus CMY color. It produces vibrant color transfers on both light and dark apparel, hard goods, promotional merchandise and more! 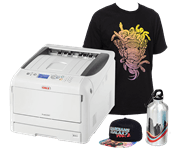 The Pro8432WT Laser Transfer Printer offers the versatility that lets you adopt new applications, access lucrative new revenue streams and grow your business. 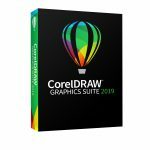 It’s the easy-to-use, time-saving and affordable alternative to screen printing, allowing you to quickly and cost effectively deliver unique output with little to no setup costs. The compact Pro8432WT Laser Transfer Printer fits on a desktop and prints on transfer sheets up to 11″ x 17″ (Tabloid), combining enhanced High Definition (HD) Color printing and Single Pass Color™ technologies with a straight-through paper path for output that ordinarily requires expensive specialty media printing processes. There is no compromising your designs or worrying about how vibrant colors will look on dark material. 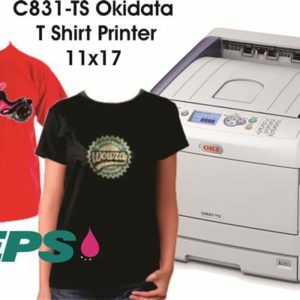 The Pro8432WT White Toner Laser Printer for making T Shirts enables you to easily print what you need in-house, when you need it — with breathtaking results. 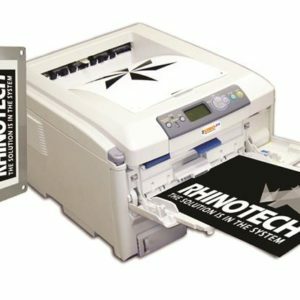 Fast print speeds and increased productivity – The Pro8432WT Laser Transfer Printer keeps work flowing smoothly, producing up to 16 full color transfers per minute (letter-size) and up to 9 tabloid-size (11″ x 17″) transfers per minute, even when applying full coverage at high resolution. 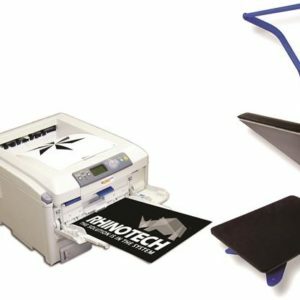 Approved transfer media feeds from the 100-sheet Multi-Purpose Tray which also handles postcards and invitations. For day-today printing, the Pro8432WT Laser Transfer Printer has a 300-sheet paper tray and prints in color plus black through a mix of Cyan, Magenta, and Yellow toner. We speak your language – The Pro8432WT Laser Transfer Printer delivers customized support for transfer media, allowing you to quickly set up jobs using familiar terms. This helps boost productivity by eliminating trial and error in the media selection process. 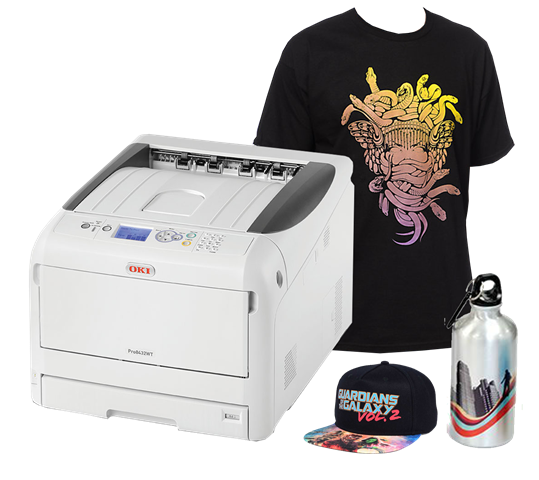 Unmatched warranty support – OKI White Toner Laser Printer for making T Shirts is so confident in the reliable performance of the Pro8432WT Color Laser Transfer Printer that we provide a 2-Year On-Site limited warranty on the printer3and an industry-leading 5-year warranty on its LED printheads. You get a full white cartridge and CMY is 30% filled on the toner cartridges. 1) Published performance results based on laboratory testing. 2) Contact your authorized C831TS Dealer for a list of approved transfer media. 3) Available in the U.S. and Canada only. 4) Includes weight of consumables. with 5,000-page Cyan, Magenta and Yellow “starter” toner cartridges. with 4,000-page White “starter” toner cartridge (based on 5% coverage). 7) Estimated life, based on 3 pages per job.